An incomplete analysis of SingPost. SingPost was a company I was looking at just a few months before Alibaba came into the picture. Thinking of adding it as an investment for income, I was waiting for the share price to go a bit lower before buying. However, Alibaba came in and bought a 10% stake at $1.42 a share and the share price went ballistic. This was in 1H 2014. I told myself I should be patient and wait. Then, Alibaba increased their stake late last year to more than 14%, paying $1.74 per share. Many people tell me SingPost is doing the right thing to embrace e-commerce and that the partnership with Alibaba is a good thing. Instinctively, I know that they are probably right. If an IT dinosaur like me buys things online, e-commerce is a success story that will continue to grow. Of course, I want to benefit from that story as an investor. If you want to continue reading, please take note that I do not have the expertise to analyse SingPost completely. In fact, I do not have the expertise to analyse most businesses, including those I am invested in, completely. All I can do is to understand the big picture and use a bit of common sense. Hopefully, I get it approximately right most of the time. With SingPost, we know that its traditional mail business is in decline. The weakness is not seasonal nor cyclical. It is a structural issue which means the problem is here to stay and will likely get worse. SingPost is part of the old economy and to survive in the new economy, it must re-invent itself to stay relevant. Logistics and e-commerce are the drivers in this reinvention and they make for logical choices. Having said this, transforming a business on such a large scale takes time. It is not going to happen overnight. It also means trying new things, taking on risks and spending, in some cases, a lot of money. Evidently, the transformation has not been an easy one for SingPost and it is still ongoing. They will surely get some things wrong. However, if they get things right more often than wrong, eventually, they should do well enough. Mr. Market was willing to pay as much as $2.06 a share for SingPost in January 2015. It didn't make any sense to me and I said as much on my Facebook wall. SingPost's net profit improved about 6%, year on year, and Alibaba paid $1.42 a share in 1H 2014 which was already more than 10% higher than what I was looking to pay that time. Pay 45% more for a 6% improvement in net profit? Unless we were sure that SingPost was going to deliver a 40% improvement in profit in the following year, why do it? Now, why did the share price go up as much as it did? Incidentally, SingPost delivered only a 7% improvement in net profit in the next year which was pretty decent but, of course, Mr. Market was disappointed. In 2016, SingPost's capital expenditure (CAPEX) shot up, free cash flow went negative and its profit took a big hit. Of course, with a change in dividend policy, their status as a predictable dividend payer is also no more. In better years, SingPost generated earnings per share (EPS) of more than 7c. Going by what we already know, SingPost's EPS should be much lower now. With a new dividend policy to pay 60% to 80% of earnings as dividends, even more realistic investors who are expecting a reduced dividend per share (DPS) of 4.2c to 5.6c a year could be disappointed. Those who still think they are going to be paid a DPS of 7c are delusional. When SingPost registered a massive drop in quarterly EPS to 1.28c, we had to ask why? Ask if the reasons for the decline in earnings are enduring? 1. Higher expenses in e-commerce business. 2. Costs related to new logistics hub. 3. Loss of rental income at SPC Mall. 4. Decline in domestic mail volume. To me, only item 4 is enduring in nature. Items 1 and 2 are probably CAPEX items which could happen again but are not permanently recurring in nature. Item 3 is definitely temporary in nature. So, things could look grim for a while more but they should start looking up given enough time. How much time? Years, maybe. I don't know. Since I don't know, I don't want to be too optimistic. OK, I know I said before I should not be too pessimistic either. However, since I don't know, erring on the side of caution is probably a good idea. So, I am going to be more pessimistic this time and you will soon see that there is maybe a method in my madness. Assuming all the reasons for the massive decline in EPS are enduring and that a quarterly EPS of 1.28c is the norm, we get an annual EPS of 5.12c. Remember that this is just an assumption as you continue reading this blog. With the new dividend policy, we might get a DPS of between 3c to 4c, therefore, which is a big reduction from the more familiar 7c. Investors for income who want at least a 5% dividend yield and who are used to receiving 7c a share would only buy if share price were between 60c to 80c then. Did you ask how likely is this? Never say never. SingPost is no longer an attractive investment for income at least for now although its management is still committed to paying a dividend. To invest in SingPost is to want to have a stake in the new economy. To invest in SingPost, we must be willing to accept a lower dividend yield while we wait for better days. How much lower a dividend yield is acceptable in the meantime? This is pretty subjective but it is probably good to have an idea in order to make a decision on what are sensible entry prices. I feel that a 2.5% dividend yield is acceptable. I came up with this number by using an example. Mr. Kuok thinks Wilmar was cheap at $3.00 a share and Wilmar had a DPS of 7.5c. Wilmar paid out about 50% of earnings as dividends. I know SingPost and Wilmar are in different industries but they are both undergoing transformation, facing their own challenges. Shareholders should expect lower dividends. You can disagree but don't bite my head off. I know that the comparison is not entirely appropriate but, on an intuitive level, it makes sense to me. I am a simple minded person and rely on stories I know. Based on the above thinking (and the assumptions made earlier about SingPost's earnings), if we were to match Wilmar's 50% payout ratio to achieve 2.5% dividend yield, then, we should only buy SingPost at about $1.00 a share. Since SingPost is going to pay at least 60% of earnings as dividend, we would get a 3% yield at $1.00 a share, using the assumption in this blog which gives us a DPS of about 3c. I don't know if SingPost's share price would go lower and if it should go lower, how much lower might it go? I have been waiting for a while. I am used to waiting. So, I am going to wait and see. "TradeGlobal accounted for S$169 million in goodwill and S$43 million in customer relationships - an intangible asset - in SingPost's 2016 financial statements. "But TradeGlobal incurred a significant loss instead of a projected profit in the third quarter peak season, and is expected to make a loss for the full year, SingPost said on Friday (Feb 10)." Of the expenses, 1) might be enduring. The execution of The US acquisition is bad. But I agree with u transformation takes some trial and Error. I would think to impair Trade global winds is wise. I have bailed out after the release of the results. Was lucky I did not suffer a loss. I believed when they announced their impairment (if u consider the size of goodwill etc) the fall in NP is going to be significant and nil dividend is not impossible. I am trying to time the market here. Think I can get a better price a few months down the road. Long time no talk. Thanks for sharing your insights. Due to the weaker performance, dividend was reduced 67% yoy and 50% qoq to 0.5 cents. This represents the second time dividend has been reduced as last quarter’s dividend was also reduced 50% yoy and qoq to 1 cent per share. Given the weaker than expected results, potential huge asset mark-down in the next quarter and continued dividend reduction, we are lowering our recommendation on Singpost to Neutral and taking it out of our “2017 recommended list”. I was trying to understand your comment in the post "Based on the above thinking (and the assumptions made earlier about SingPost's earnings), if we were to match Wilmar's 50% payout ratio to achieve 2.5% dividend yield, then, we should only buy SingPost at about $1.00 a share." Currently SingPost has given 0.5 cents dividend from July to Nov. If we use 2.5% dividend yield, does that mean the share price should be at least 2 dollars based on your comment? You should not look at dividends received in the past. They are history. In future, dividends will most likely be much lower because they will be a percentage (60% to 80%) of earnings which are much lower. Thank you for your post. I am a born-again investor. Haha... ya, basically I am one of those "speculators" and now trying to at least better analyze my stock picks more properly. And I have learned quite a bit from you. Thank you for that! "Based on the above thinking (and the assumptions made earlier about SingPost's earnings), if we were to match Wilmar's 50% payout ratio to achieve 2.5% dividend yield, then, we should only buy SingPost at about $1.00 a share." Do you mind sharing the math to derive at $1.00 a share at 2.5% dividend yield? I am glad you have decided to become an investor again. The math is in the blog post. 1. Assumed EPS of SingPost. Financial freedom through Dividend Machines. Finally you talked about a stock I own. One of my crown jewel was Singpost, which I bought for $0.98 way back in 2012 (I'm 26 yrs old now). 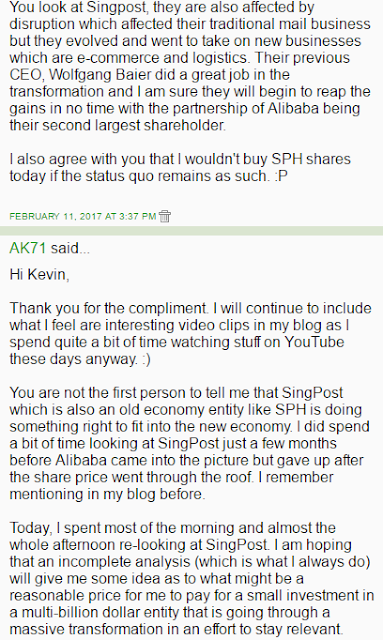 Even when Singpost reached $2.06, I refused to sell because I believed in the transformative change. Even tho I collected 40% of dividend, I "lost" around 70% capital gain. Buffett always say to hold stocks as long as you know it's good. However, because the drop in share price, my XIRR has been losing to mkt returns YOY. At most, I earn the dividend as returns. Do you recommend I shld sell this stock as it has been losing to mkt or continue holding for a longer term gain? Is Singpost going to succeed in its drive to reinvent itself and if it does succeed, how long is it going to take? This is in the realm of speculation. I have been in similar situations before. So, it is a bit of a deja vu. Thanks AK, buying at a price we will not sell at and selling at a price we will not buy at seems very sound. Guess I have to learn how to release my stocks when it gets overvalued. Getting nearer and nearer to your price target :) I went to the new mall that they recently opened (at their old operations place). Mall is managed by CapitaLand. Not all shops are opened yet, but for now seems that there is good crowd flow in the area. For sure, as an investment for income, SingPost is not what it used to be. A pity that they they burnt so much cash in their effort to reinvent themselves. Still, this is a story of transformation that is probably worth buying into if the price is right. I bought Singpost share between 2015 and 2016 for $6424.69 (4300 units). Avg price per unit is $1.49. I am currently seating at a paper lost of $800 + for this stock. I read from your blogpost that you will buy singpost if it's below $1. What should I do? I got it when I am a newbie and I am still one. Should I wait for the share price to be around $1.50 so that I can breakeven since I am still young (24 years old)? or should I exit to use this money for better stock opportunist? Can you talk to yourself? 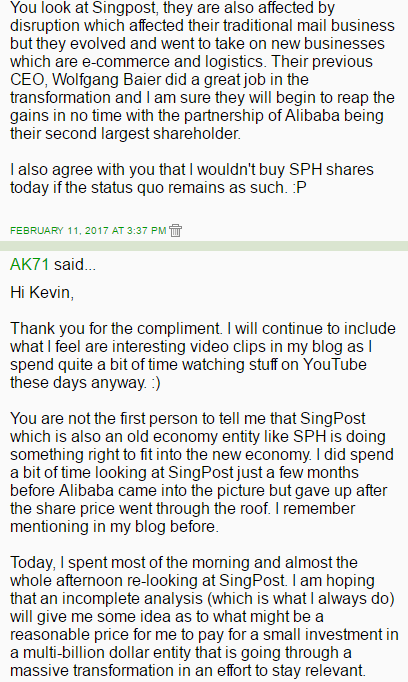 Ask yourself if you did not buy Singpost at $1.49 a share then, would you buy it now? You will find your answer.